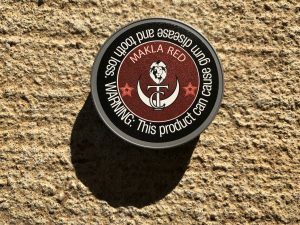 Today we’re going to be talking about Makla Red, a product I’ve heard about for many years but never tried until now. Makla means “food” in the Arabic language. It is a mix of pre-chopped Rustica tobacco leaves cut into small pieces and texturizing agents. Makla is 33% tobacco and 57% texturizer. 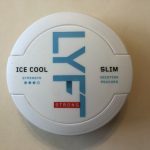 Makla is used the same way as loose snus – you take a pinch and put it in your upper lip! 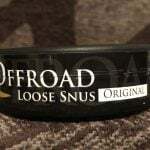 You can handbake it, or use a snus portioning tool! 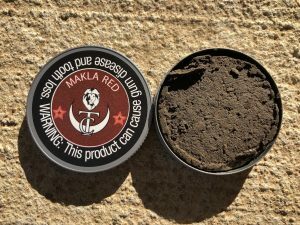 The flavor description for this product says, “Makla Red has a distinctively spicy flavor, this will suit anyone looking for tobacco that makes a serious impression. Comes in a plastic tin.” Makla comes in a 20 gram tin and has a nicotine content of 13mg/g. As you can see, the tobacco is packed pretty well. I find it’s extremely easy to bake by hand, but you can use a tool if you choose to do so. When I open the can, the aroma I notice is straight up tobacco. It’s a rich, present tobacco smell. I felt the nicotine pretty quickly; about 5 minutes after I put it in I’m feeling a nice kick of nicotine! 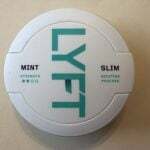 The flavor is really interesting, it’s not like any snus product I’ve ever had before. The flavor is a present, earthy tobacco taste. I notice a little spicy taste in the background, which may come from the tobacco itself as it doesn’t really taste like pepper. The tobacco itself stays together pretty well in the lip; usually I can keep a prilla of this in for about 30-45 minutes on average. The taste lasts a pretty good amount of time, as well. Makla Red is interesting. I’m glad I tried it. Now, it’s not something I would use full time, but I can see myself grabbing a can of this here and there to get something different, especially when I want a loose product with a present tobacco flavor!